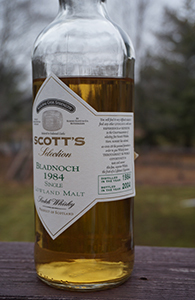 This Bladnoch 21 was distilled prior to the distillery’s takeover and revival under Raymond Armstrong. As most whisky geeks know, that era too has ended, with the distillery now in receivership. It’s unknown what its fate will be. Hopefully, it will be purchased by someone who will keep it going and who will also continue Raymond’s approach of making simple, good whisky and marketing it at a competitive price without any frippery. This seems unlikely but let’s hope for the best. For now at least some of the Armstrong era releases can still be found at reasonable prices as can older indies such as this one. Renowned TTB stalkersleuth, Sku reported details yesterday of three K&L casks of Bladnoch whose labels are in the process of being approved. There is to be a lightly peated 12 yo, a heavily peated 3-4 yo, and a 21 yo. When the casks are ready there will doubtless be an email from K&L proclaiming these the greatest casks of Bladnoch ever bottled. Of course, earlier this year David D. all but said that no impressive whisky has yet been bottled by the Armstrongs (who own Bladnoch); and so it is entirely possible that we will be told that K&L’s casks are the only great casks of Bladnoch ever bottled. Well, though I hope these casks will be as good as we’ll be told they are (and fairly priced as Bladnoch always is in the UK and EU) I do hope I will be wrong about the hyperbole. If I am wrong I will post a video of Werner Herzog eating his shoe. 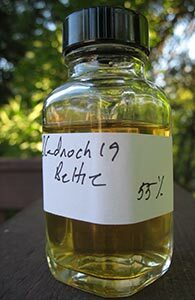 In the meantime, here’s one of a number of very good Bladnochs released without any fanfare by the distillery in recent years. This is a 19 yo from a couple of years ago. 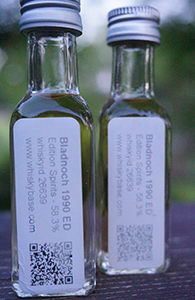 Bladnoch, small and family-owned, is one of the few active distilleries in the Lowlands region. The distillery is beloved among whisky geeks on account of their no-frills, no-nonsense approach to the industry, their commitment to reasonable pricing, and a very high quality of whisky. You may not always read this online but it is true: there is no other distillery in Scotland that offers such good whisky at such attractive prices. If someone tries to tell you different (on any part of this) they don’t know what they are talking about. As you may have surmised, there was someone who tried to tell people different some months ago and he took quite a lot of stick for it online. 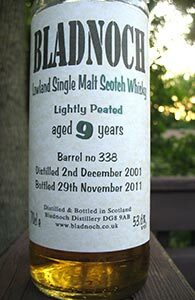 Oh hell, it was David Driscoll of K&L, who saw fit to announce upcoming private releases of casks of Bladnoch by denigrating the quality of the whisky already released by the owners–which he eventually acknowledged he had very limited experience of. Anyway, as I noted, he took a lot of stick for it, and there’s no need to fight the battle again (he and I went at it on a whisky forum for a bit). David seems like a good guy, just prone to getting carried away. Certainly, if he tasted the whisky I am reviewing tonight I hope he’d acknowledge its quality.